Congestive heart failure can be a serious ailment leading to shortness of breath, fluid retention, and early death. About 2% of adults are diagnosed with this condition; and for those 65 and over 6-10% are affected. The most common causes are heart damage due to heart attack and blocked arteries but other conditions such as leaky valves, viral infections, and inherited conditions can also be causative. As a damaged heart continues to pump its undamaged tissue can get overworked and eventually wear out. 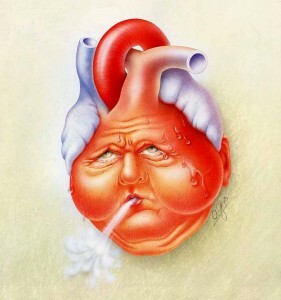 As a result congestive heart failure tends to get worse with time. Treatments for this condition date back to over two hundred years ago with the introduction of digitalis, a derivative of the foxglove plant. Although digitalis was the mainstay of treatment for centuries, modern studies have shown that digitalis, while making patients feel better, did not prolong longevity. Over the last 30 years there has been incremental progress in the treatment of this condition as researchers have gradually better understood the underlying mechanisms contributing to worsening heart failure. The addition of drugs such as ACE inhibitors and ARB inhibitors, which are widely used to treat hypertension, and diurtetics such as spironolactone have proven useful in extending life and reducing symptoms. Mechanical devices like resynchronization pacemakers and automatic defibrillators, which shock the heart out of fatal irregular heart beats, have found their places in the management of congestive heart failure as well. More recently beta blockers, a class of drugs which had been avoided for years in heart failure because of concerns that they would weaken the heart, are now widely used; studies have shown that they can actually help protect the heart from further damage. Heart transplantation has proven to be an imperfect solution given the growing numbers of people with congestive heart failure and the considerable challenges to perfecting a safe and effective mechanical heart have yet to be overcome. A new study reported last week in the “New England Journal of Medicine” reports on a new drug, LCZ696, part of a new class of medicines collectively known as angiotension receptor-neprilysin inhibitors. Combined with a traditional ARB drug valsartan, this new drug was studied in a group of over 8000 patients with heart failure; half received the new combination and the other half received standard treatments. Over a study period of more than two years, there was a 13% decrease in death, a 21% decrease in hospitalizations, and an accompanying significant improvement in symptoms. This study is a tribute to the international collaboration of researchers and the participating patients and will likely usher in a new era in the treatment of this ailment. Know someone who is looking for a great primary care practice? We are now accepting new patients! Click Here to start receiving my weekly health blog post via email – It’s Free!